A token amount of plot: Towards the end of Japan's feudal era, thirteen unemployed samurai are recruited to take out the corrupt and sadistic lord Naritsugu (Gorô Inagaki) who would otherwise soon take the throne and plunge the land into chaos. One-by-one the not-so merry band of hit men join the cause, recruited by Shinzaemon Shimada (Kôji Yakusho) to carry out this morally gray assignment. 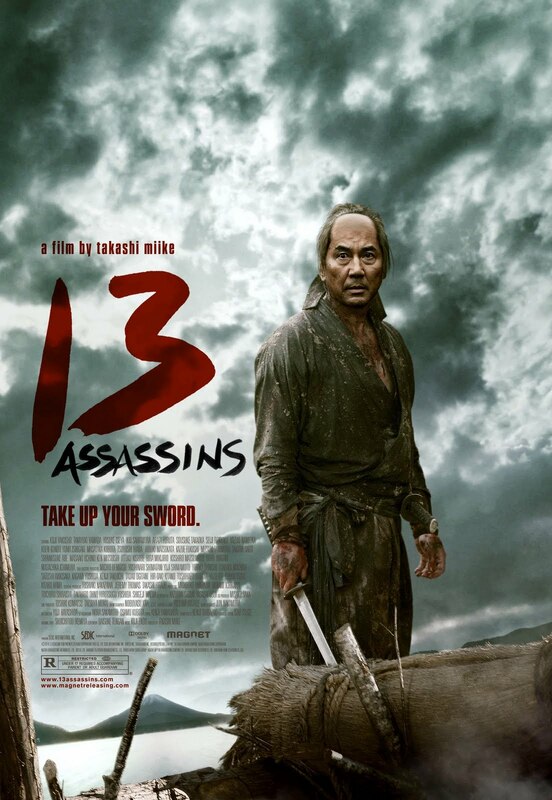 As the group travels onward, it is revealed that the evil lord is being guarded by Hanbei (Masachika Ichimura), who is now the tyrant's chief samurai protector. Questions of loyalty versus morality are eventually answered in blood as (obviously) swords eventually cross and the fate of a nation is decided. The first two acts are pretty much all set-up, with a refreshing emphasis on character over visceral imagery. The film obviously looks gorgeous, shot in glorious widescreen and with top-notch technical credits to match. Miike quickly establishes the moral justification for what is basically a political assassination and/or coup, as the first reel has just a few horrifying examples of Naritsagu's arbitrary disregard for human life and/or general decency. But Miike does not revel in graphic violence, showing us just enough right at the start to make sure we understand just what is at stake. Still, the moral implications for all parties are not ignored and remain a notable subtext right up to the end. But for most viewers, the big question is how the film pays-off its various strands. Well, the finale is basically one 45-minute long action sequence, a mass battle between our thirteen warriors and about two hundred of Naritsugu's men. To put it simply, this is an all-time classic bit of action filmmaking, shot and edited with long, fluid takes and constant sense of geography. But even during the seemingly unending mayhem, Miike never loses sight of the emotional investment and practical consequences for what is unfurling before our eyes, which of course makes it that much more invigorating. 13 Assassins is an often glorious adventure film, refreshingly holding back the spectacle until the audience is given a chance to care, and then unleashing a breathtaking climax that is truly one for the ages. Heck, even if you find yourself not terribly involved for the first two-thirds of the picture, it's worth it for the pay off. It is a fine, accomplished picture that does its genre proud. That it happens to contain an all-time great action finale is both a defining reason to recommend it and almost beside the point in the grand scheme of its storytelling. Point being, it absolutely earns its all-out finish and it absolutely delivers.